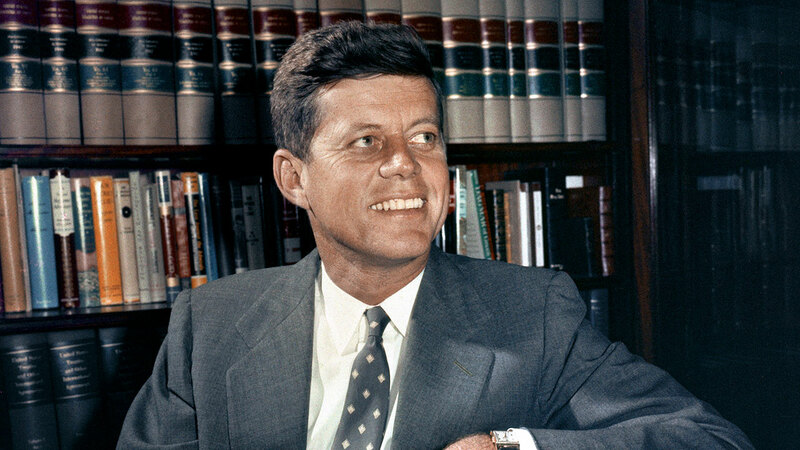 Sen. John F. Kennedy, D-Mass., is shown in his office in Washington. WASHINGTON -- President Donald Trump says he doesn't plan to block the scheduled release of thousands of never publicly seen government documents related to President John F. Kennedy's assassination. "Subject to the receipt of further information," he wrote in a Saturday morning tweet, "I will be allowing, as President, the long-blocked and classified JFK FILES to be opened." The National Archives has until Thursday to disclose the remaining files related to Kennedy's 1963 assassination. The trove is expected to include more than 3,000 documents that have never been seen by the public and more than 30,000 that have been previously released but with redactions. Congress mandated in 1992 that all assassination documents be released within 25 years, but Trump has the power to block them on the grounds that making them public would harm intelligence or military operations, law enforcement or foreign relations. "Thank you. This is the correct decision. Please do not allow exceptions for any agency of government," tweeted Larry Sabato, director of the University of Virginia Center for Politics and author of a book about Kennedy, who has urged the president to release the files. "JFK files have been hidden too long." The anticipated release has had scholars and armchair detectives buzzing. But it's unlikely the documents will contain any big revelations on a tragedy that has stirred conspiracy theories for decades, Judge John Tunheim told The Associated Press last month. Tunheim was chairman of the independent agency in the 1990s that made public many assassination records and decided how long others could remain secret. Sabato and other JFK scholars believe the trove of files may, however, provide insight into assassin Lee Harvey Oswald's trip to Mexico City weeks before the killing, during which he visited the Soviet and Cuban embassies. Oswald's stated reason for going was to get visas that would allow him to enter Cuba and the Soviet Union, according to the Warren Commission, the investigative body established by President Lyndon B. Johnson, but much about the trip remains unknown. Longtime Trump friend Roger Stone, who wrote a book alleging that Johnson was the driving force behind Kennedy's assassination, had personally urged the president to make the files public, he told far-right conspiracy theorist and radio show host Alex Jones this past week. "Yesterday, I had the opportunity to make the case directly to the president of the United States by phone as to why I believe it is essential that he release the balance of the currently redacted and classified JFK assassination documents," Stone said, adding that "a very good White House source," but not the president, had told him the Central Intelligence Agency, "specifically CIA director Mike Pompeo, has been lobbying the president furiously not to release these documents." "Why? Because I believe they show that Oswald was trained, nurtured and put in place by the Central Intelligence Agency. It sheds very bad light on the deep state," he said. After the president announced his decision, Stone tweeted: "Yes! victory!" The files that were withheld in full were those the Assassination Records Review Board deemed "not believed relevant," Tunheim said. Its members sought to ensure they weren't hiding any information directly related to Kennedy's assassination, but there may be nuggets of information in the files that they didn't realize were important two decades ago, he said. "There could be some jewels in there because in our level of knowledge in the 1990s is maybe different from today," Tunheim said. The National Archives in July published online more than 440 never-before-seen assassination documents and thousands of others that had been released previously with redactions. Among those documents was a 1975 internal CIA memo that questioned whether Oswald became motivated to kill Kennedy after reading an AP article in a newspaper that quoted Fidel Castro as saying "U.S. leaders would be in danger if they helped in an attempt to do away with leaders of Cuba."